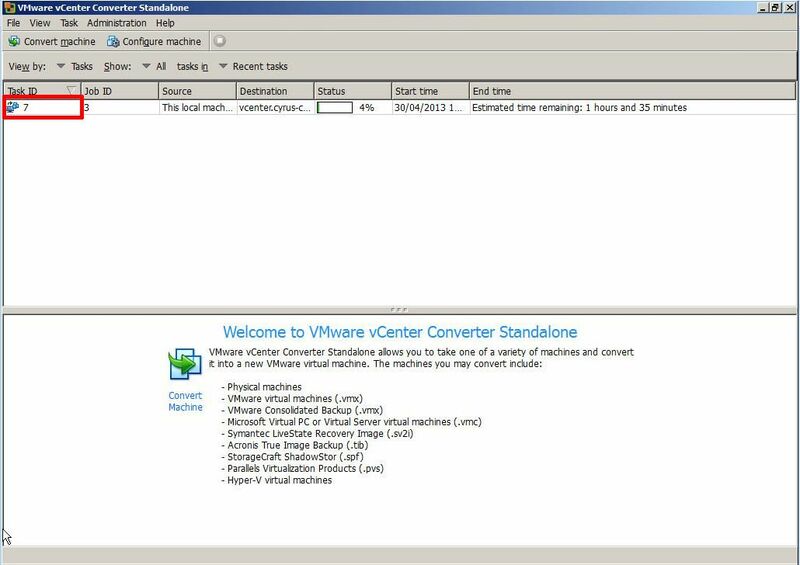 "Poor Man's Replication of a Physical or Virtual machine to a VMware vSphere Hypervisor Host (ESXi) for FREE"
I have already written three Experts Exchange articles on the use of VMware vCenter Converter Standalone 5.x. If you have missed these articles, they are listed here for your convenience. VMware vCenter Converter Standalone is an excellent FREE software tool for creating P2Vs or V2Vs, but there is another often "hidden function" which is rarely used by VMware Administrators. The function is called Synchronize. 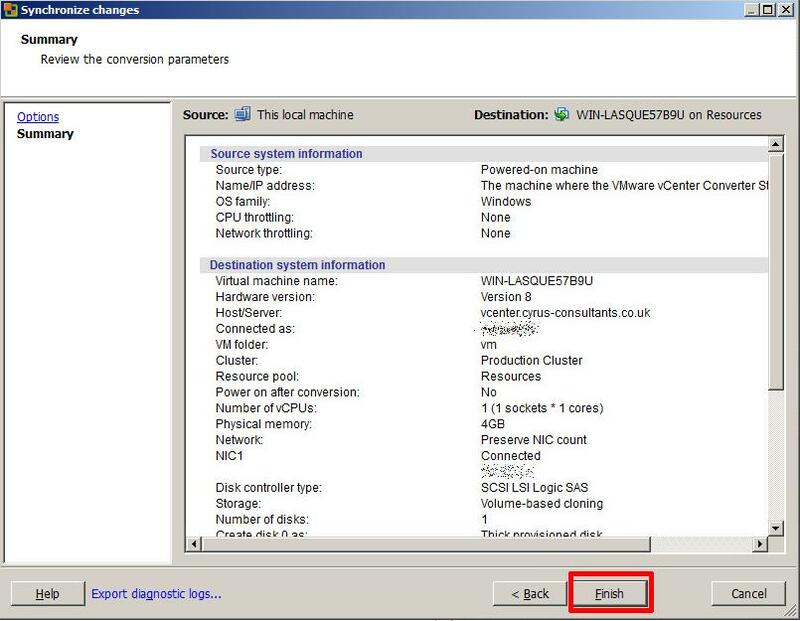 This function can be used to Synchronize changes between a physical or virtual computer, which has already been P2Ved (V2Ved) to another virtual machine on another VMware vSphere Hypervisor (ESXi) host. 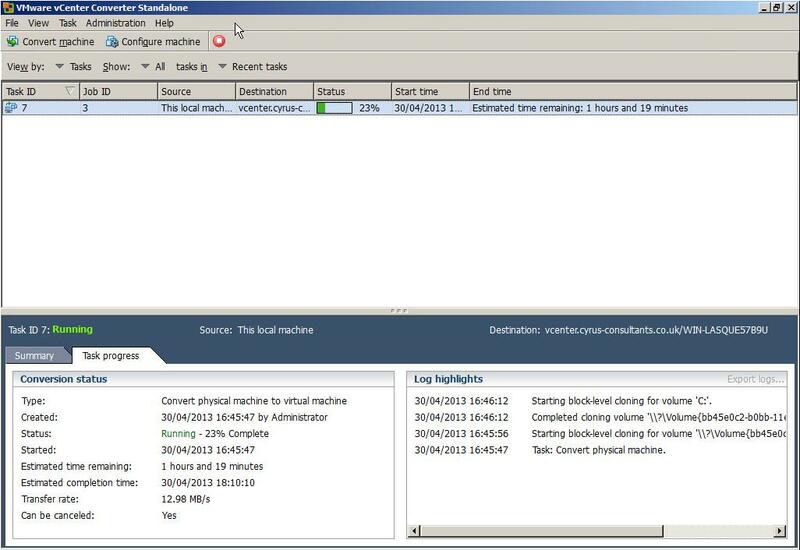 The same function can be used, to help unattended "cut over times" when completing a P2V (V2V) in Production, you could create the original P2V (V2V) at 9.00am, and then using synchronize, finally sync all changes made during the day, and "cut over" to the virtual machine out of hours, at 23.00pm. Some of our clients use this software and function, as a free alternative to replication to a second DR site and ESXi host. The ESXi host could be using the FREE VMware vSphere Hypervisor. 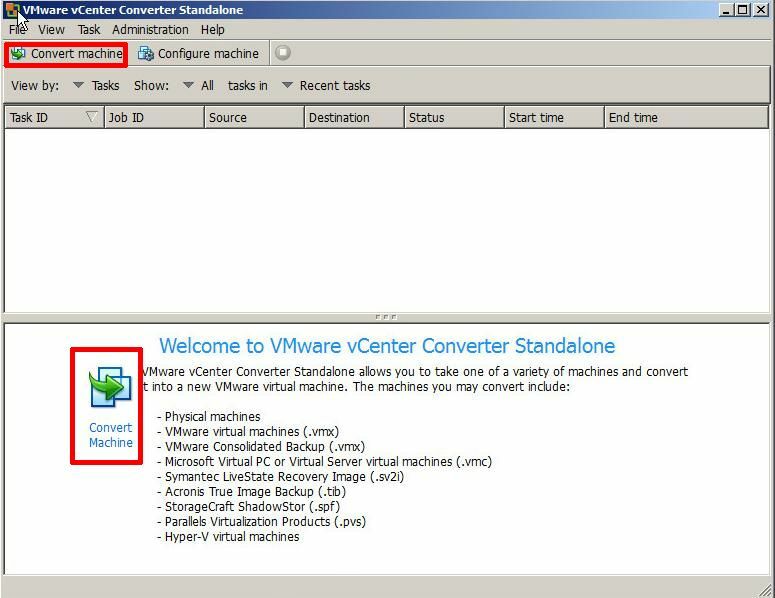 In this article, I'll show you HOW TO: Synchronize changes when completing a P2V or V2V with VMware vCenter Converter Standalone 5.1. 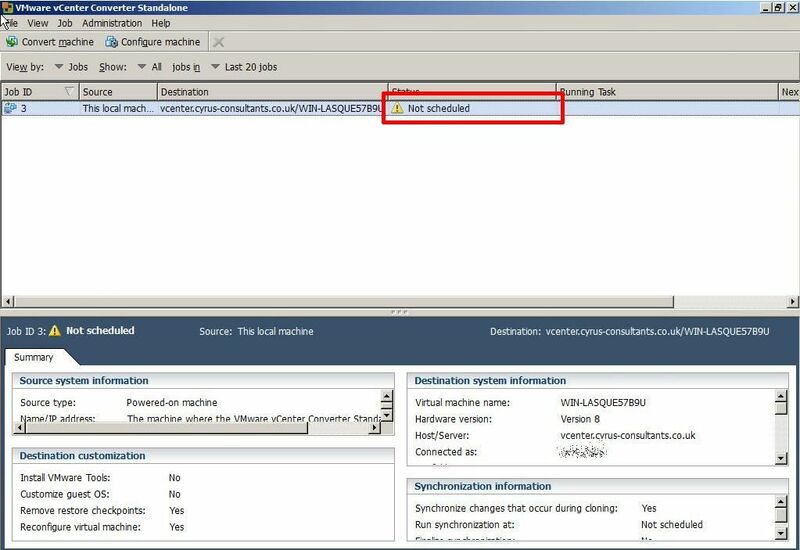 In the example below I'll be using a virtual machine, creating a V2V and then synchronizing additional changes made to the source virtual machine to the destination VM (our DR copy). Install VMware vCenter Converter Standalone 5.1 on the computer to be synchronized. 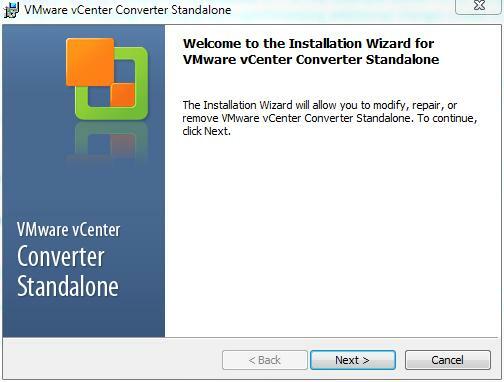 In this example, I will be installing VMware vCenter Converter Standalone 5.1 on the virtual machine. 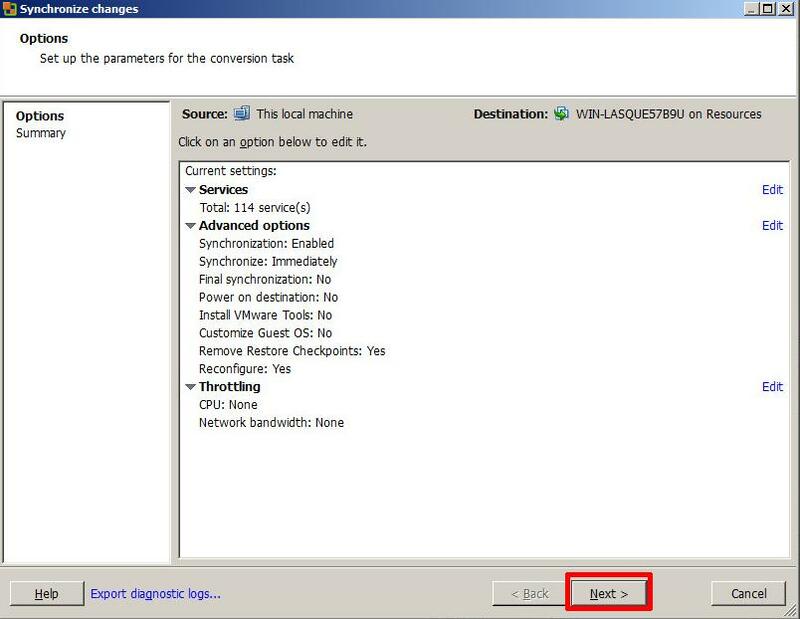 Click Next, and follow the installation wizard to the end, and Click Finish. 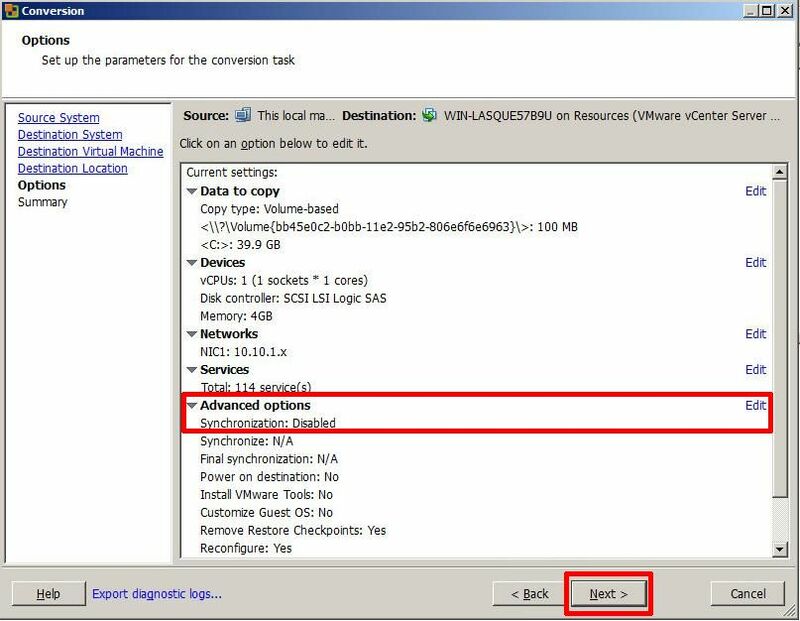 If you left the Tick in the Box for Run Converter Standalone Client now. 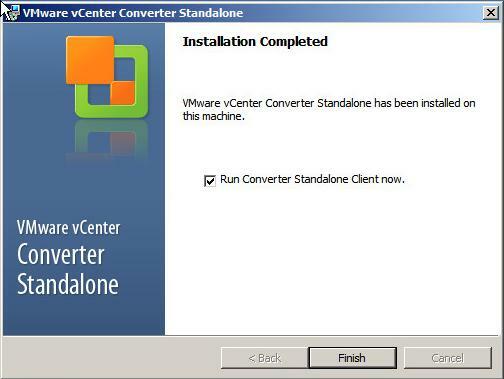 VMware vCenter Converter Standalone will start, otherwise you will need to click the icon on your desktop. 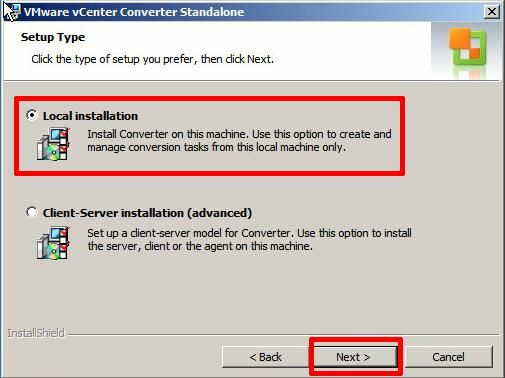 followed by Next to continue, converter will identify the source machine. 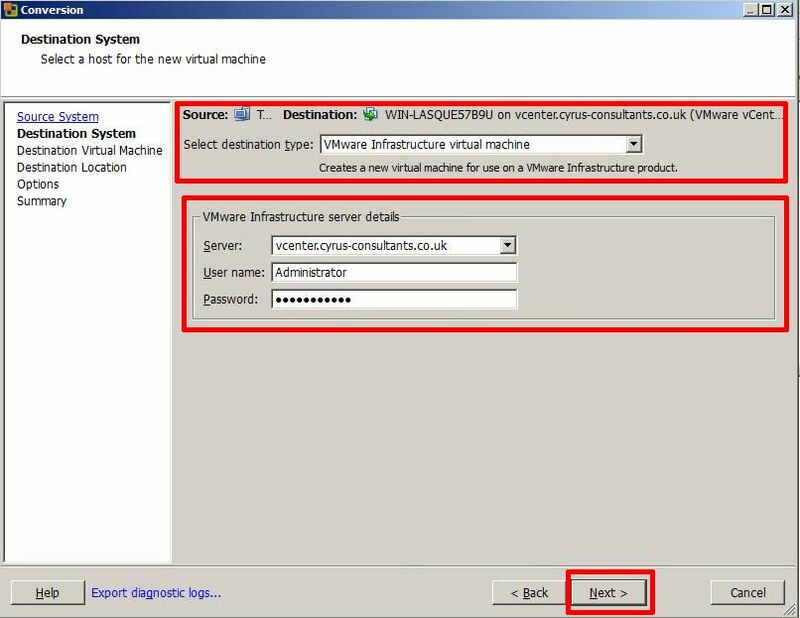 Enter the destination server, username and password, in this example, I'm using our VMware vSphere vCenter server details, but if you wanted to synchronize/replicate to a standalone VMware vSphere Hypervisor (ESXi) host, you would enter the VMware vSphere Hypervisor (ESXi) host details here, e.g. 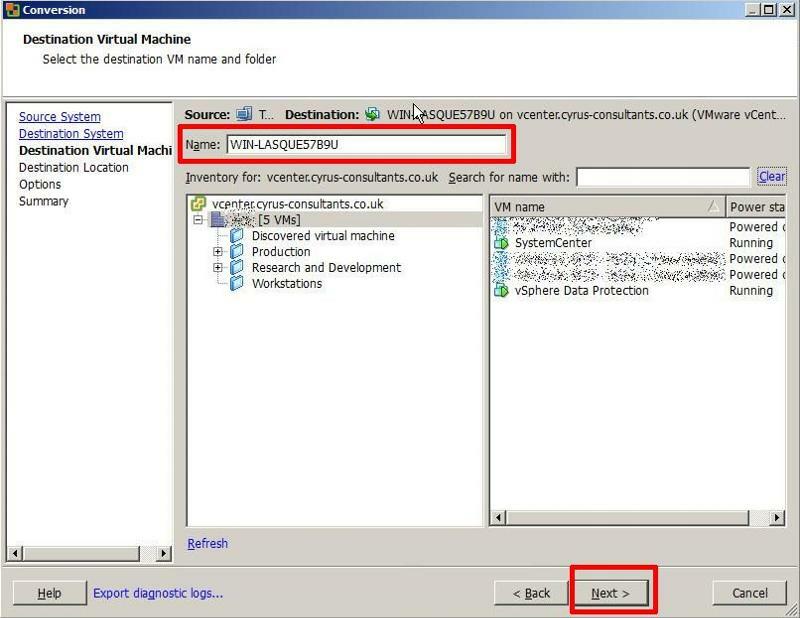 root username and password. 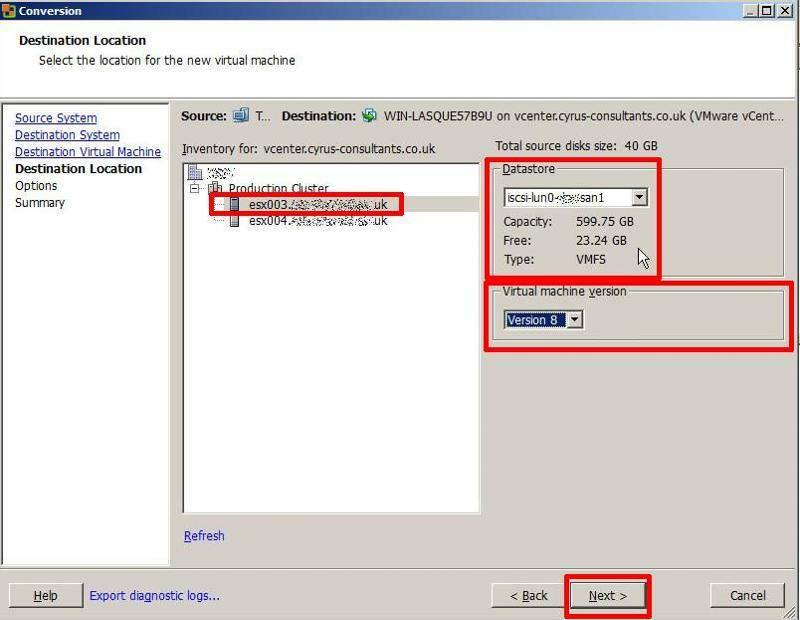 Specify the destination location for the machine followed by Next, if you are using a VMware vSphere vCenter Server and have a VMware Cluster created, you will have additional options to specify which VMware vSphere Hypervisor (ESXi) host to create the new virtual machine, also specify the datastore location. Ensure the virtual machine version matches the original VM, in this example v8.0. If you click Next at this point, the P2V (V2V) will complete as normal. 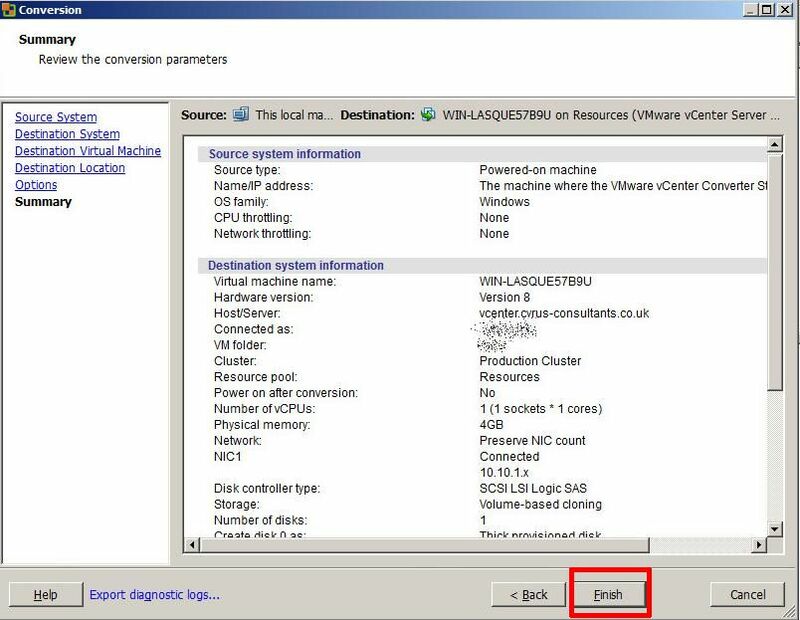 Ensure Synchronize changes is selected and ticked. Ensure Perform final synchronization is Un-ticked. 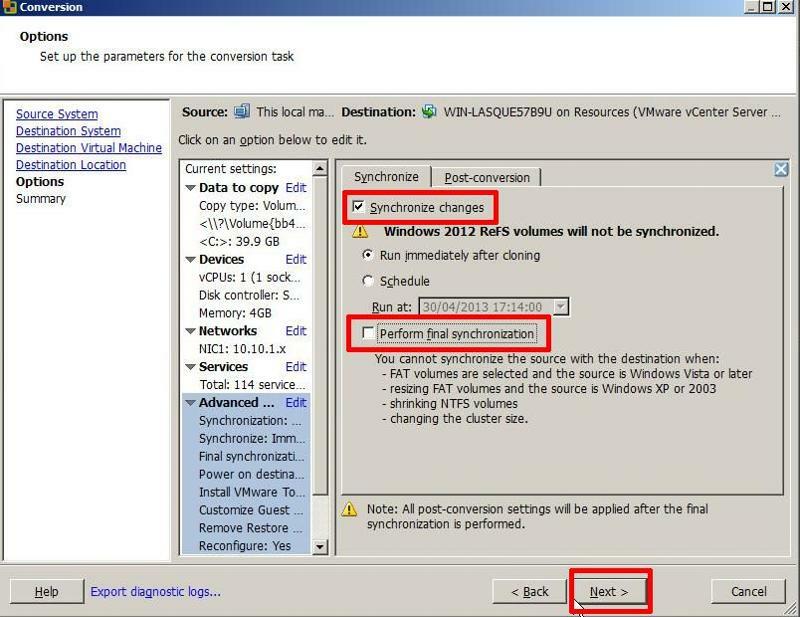 If you wanted to perform, a Scheduled Synchronize, select and set the Schedule Option. Select Next to continue, review the Summary screen, and select Finish. A P2V job will be submitted and the P2V conversion will start. If you click the Task Id, you can check on the Task Progress. If you are finding conversions time are long, see my EE Article, on how to imporve transfer times. 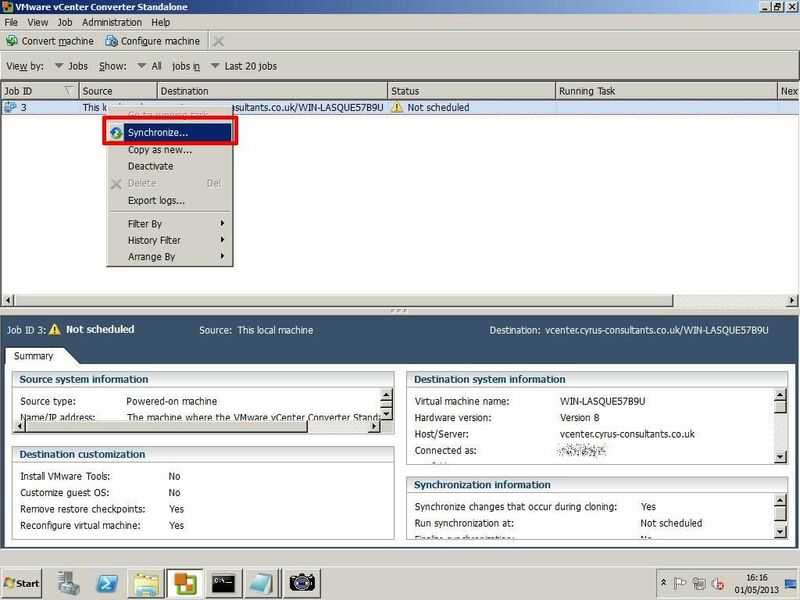 Once the initial P2V (V2V) conversion has completed, or "seeded" a new virtual machine, you can use the Synchronize function to replicate any changes that occur on the source machine to the virtual machine, the source machine could be a physical or virtual machine. 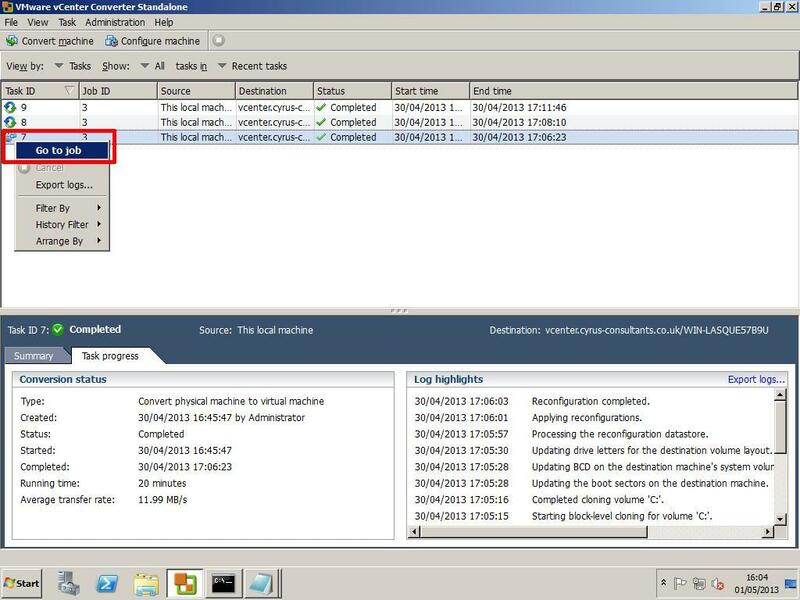 (You can check the virtual machine by disconnecting networking, and powering up the virtual machine). You will notice that the Status states Not Scheduled, this is because we did not set a schedule. 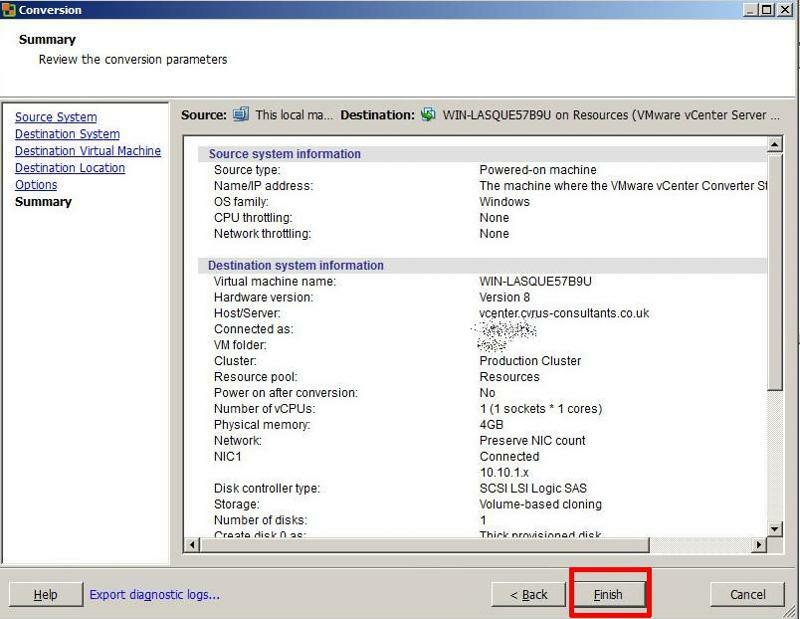 Right Click the Job Id, and select Synchronize. You will notice your Synchronize Job is Running, and it will have a new Synchronize icon, next to the job. 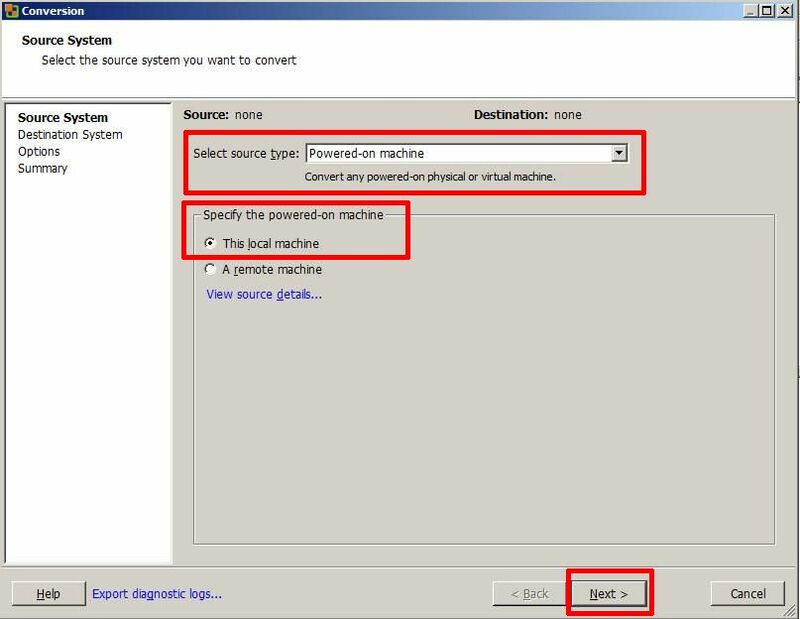 All changes in the source machine will be synchronized or replicated to the virtual machine. 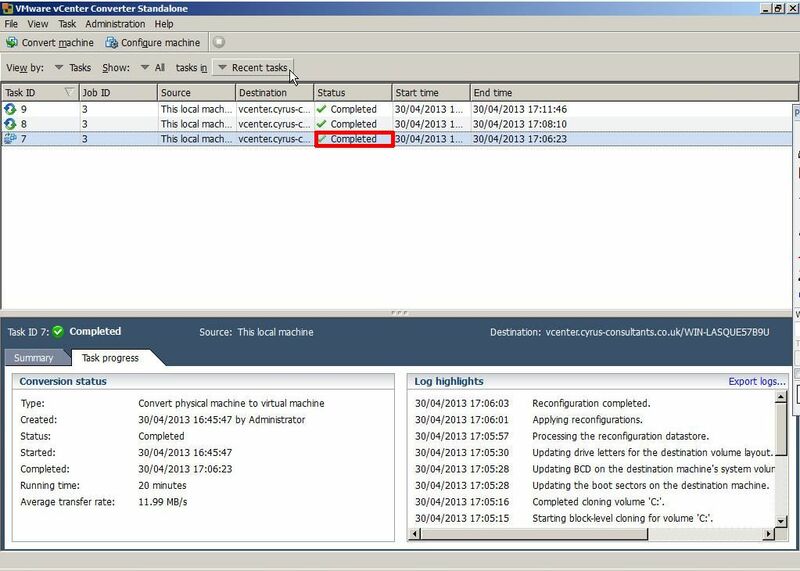 Congratulations you have successfully created a P2V (V2V) and Synchronized (replicated) your machine to a virtual machine.